Audio, video, images and quotes not the author's remain in the copyright of the originator. First published in SOSSI Journal March/April 2004. This online version was updated 16 December 2018. Scout franked zeppelin mail has been covered several times earlier in the scout philatelic press. The most comprehensive article is Lighter than Air by Douglas Uzakewicz in SOSSI Journal (SOSSI - Scouts On Stamps Society International) May/June 1995 , which also covered the Hindenburg crash flight without going in depth. This present article is an attempt to thoroughly describe what is known about the Scout franked Hindenburg crash mail. The German zeppelin LZ 129 Hindenburg was an airship, or dirigible, of the rigid type, and was built to carry passengers and mail between Europe and the Americas. The construction began in Friedrichshafen, Germany in 1931 and was completed in 1936. First flown in tests on March 4, 1936, the Hindenburg made her first flight on March 26 of the same year. She would make several awe-inspiring flights, carry hundreds of passengers and travel thousands of miles before meeting her fate. The successful flights included ten trips from Europe to North America in 1936, and six trips to South America in 1936 and one trip in 1937. The passenger cabins were equipped with an upper and lower berth, folding wash basin, a collapsible writing table and a signal used for calling the steward. The accommodations were quite plain compared to those of the luxury steamships of the day, however, most of the passengers' time was spent elsewhere in the ship. The facilities included a lounge, reading and writing room and a smoking room. The promenade provided passengers with a spectacular view of the earth below, and the adjacent dining area could accommodate all fifty passengers in one sitting. A size comparison of the Hindenburg with a Boeing 747 and the Titanic. The Titanic was only 78 feet longer than the Hindenburg at 882 feet long. Hindenburg is the largest aircraft ever to have flown. 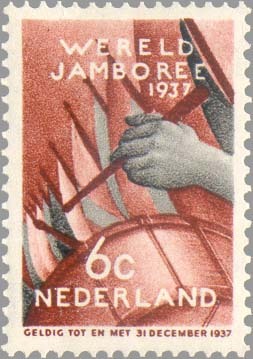 The Fifth World Scout Jamboree took place in the Netherlands in the summer of 1937. On April 1, 1937, the Netherlands issued a series of commemorative postage stamps on the occasion of the event, designed by Pijke Koch. The set consisted of three stamps: 1½ cents (domestic printed matter rate), 6 cents (domestic letter rate) and 12½ cents (foreign letters). The designs for the 1½ cents and 6 cents values need no further explanation: the 1½ cents value shows the Boy Scout badge, and the 6 cents value shows the close-up of a Boy Scout drumming, with flags in the background. Less obvious is why the artist selected Hermes for the 12½ cents stamp. Hermes was the messenger god of the ancient Greece, and "as a pathfinder to unknown places, he was ready to help others", the symbolic intention becomes clear. The Hermes statue, by the artist Praxiteles, dates from the 4th century B.C., and is now housed in the Archaeological Museum at Olympia, Greece. The Jamboree stamps saw many different usages from the First Day of Issue on April 1, until they were withdrawn from sale on September 1, 1937. Probably the most famous of all the Jamboree connected postal items is the use of the Jamboree stamps in May before the Jamboree opened on mail carried on the last flight of the zeppelin Hindenburg. LZ 129 Hindenburg left Frankfurt am Main, Germany on May 3 on her first North America flight for 1937. The world's largest aircraft ever was 804 feet long and filled with 7 million cubic feet of highly flammable hydrogen. At Lakehurst, New Jersey, cameramen and reporters waited for her arrival and recorded one of the most famous disasters in history. On landing at Lakehurst on May 6, 1937, the airship burst into flames and was destroyed in about 34 seconds. 13 passengers, 22 crew and one ground crew died. 61 passengers and crew members survived. The Hindenburg disaster at Lakehurst, New Jersey May 6, 1937. To most of the onlookers, the first sign that there was anything wrong came when a burst of flame appeared just forward of the upper fin. In seconds the flame engulfed the tail and began moving forward. The ground crew shrank back as the fire roared toward the bow and the tail began to fall. Through the flames figures could be seen dropping to the ground. The tail hit first then the rest of the ship came crashing down. Men and women, some with their clothes on fire, emerged from the inferno. Some crawled. Some ran. Some stumbled and fell. Between the first flash of fire and the crash, only thirty-four seconds had elapsed. For a period of 60 years, the cause of the disaster was blamed on burning hydrogen. One commonly accepted theory was a broken wire cutting one of the gas cells, which resulted in hydrogen escaping and mingling with air under the outer cover. The burning hydrogen theory prevailed, even though Max Pruss, the captain of the doomed ship, insisted there was no indication of gas loss on the bridge, riggers reported all gas cells were evenly inflated, and no one reported smelling garlic, the scent of which had been added to the lifting gas to help detect a leak. So what had set the outer cover afire? It is possible that the actual cause of the fire was the extreme flammability of the covering material brought about by discharges of an electrostatic nature. This interesting theory is discussed by Van Treuren  and by Duggan . The static spark theory and other possible causes are thoroughly discussed in Cause of the Hindenburg Disaster . 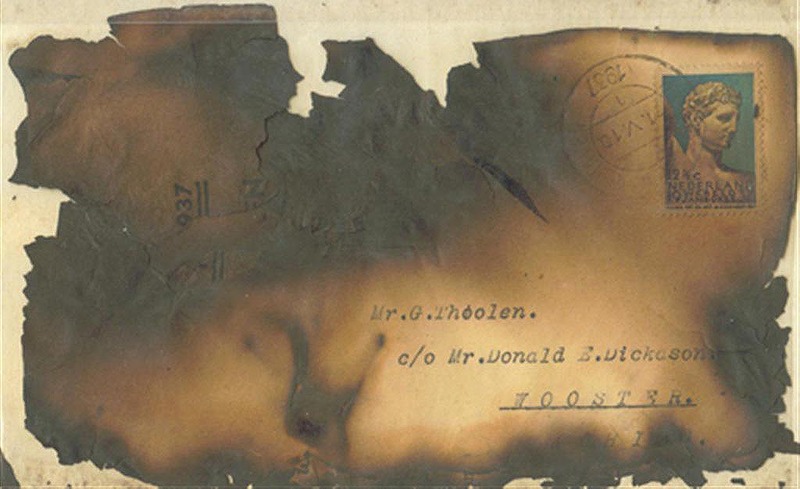 Of the 17,609 pieces of mail on board, only 358 pieces were salvaged in a burned condition. 176 of the surviving pieces were uncanceled, awaiting to be canceled on the return voyage to Europe. 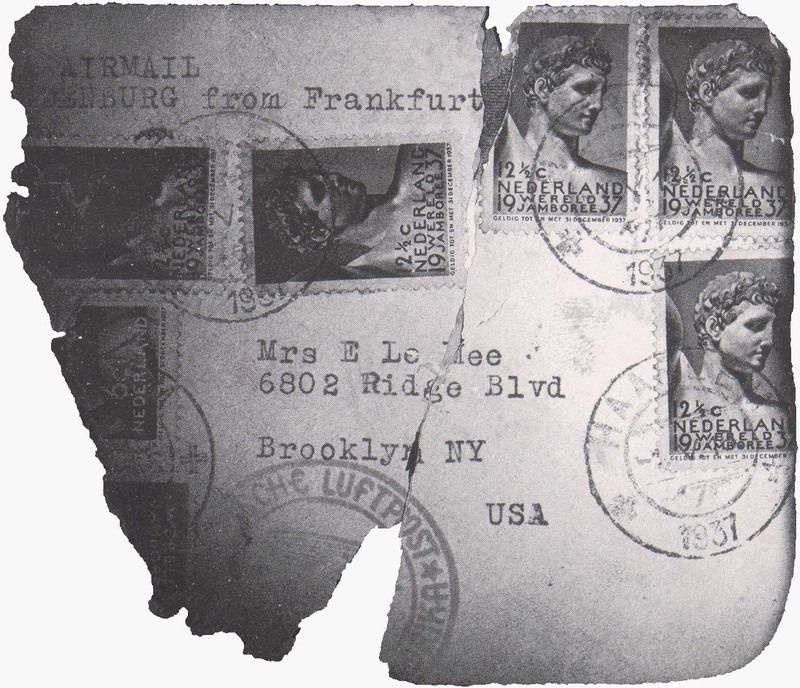 The 147 covers addressed to persons in the U.S.A. were forwarded to the Foreign Airmail Division in New York who sent the items to the addressees' Postmaster with a request to secure a registered receipt. 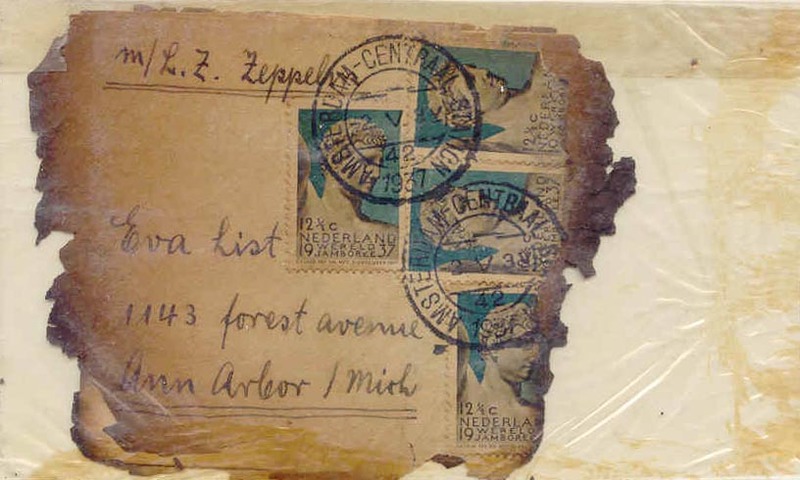 Most of the salvaged mail originated from Germany, but is also recorded from Austria, Danzig, the Netherlands, Saar and Switzerland. Zeppelin mail has always been a popular topic for air-mail collectors, and in particular the Hindenburg crash covers are much sought-after. The crash of this great airship ended the era of Zeppelin flights, but created the most elusive covers salvaged from that fiery disaster at Lakehurst, New Jersey that May evening. Of particular interest to Scout collectors are salvaged covers which are franked with one or more stamps of the Dutch 1937 Jamboree issue. 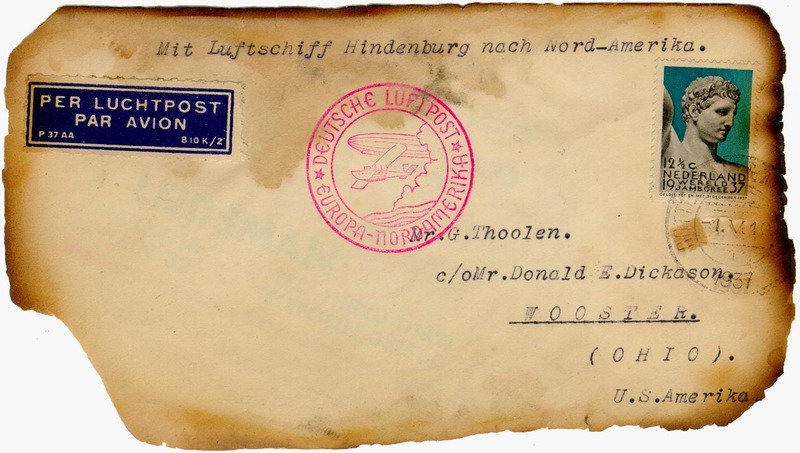 USPO letter of transmittal sent with the Thoolen covers to the Wooster Postmaster re their delivery to the addressee. The letter states 17 covers. Courtesy Matthew Bennett International auctions. Click for larger image. 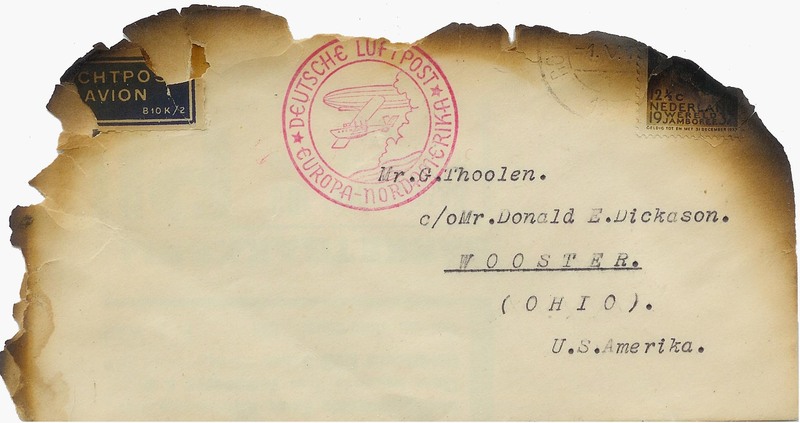 A number of Dutch covers were sent from Rotterdam, the Netherlands, to Mr. G. Thoolen, c/o Mr. Donald E. Dickason, Wooster, Ohio, U.S.A. 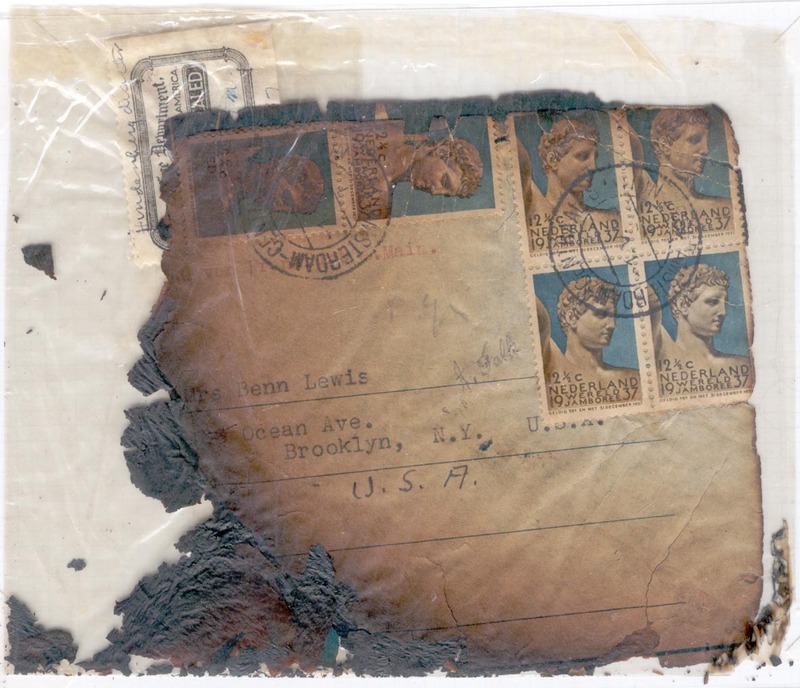 It is understood that each of these covers was franked with one 12½c Jamboree stamp, but this cannot be confirmed due to the fact that the stamp on one of the covers was totally destroyed by the fire. 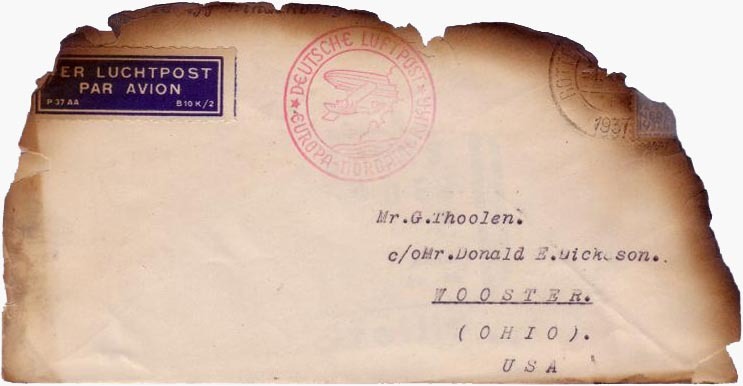 The 'Thoolen' covers were postmarked at Rotterdam-Waalhaven on May 1, 1937, then sent to Frankfurt, Germany, and placed on board the Hindenburg for the trip to America. Gerard Thoolen was a stamp dealer in 's Gravenhage (The Hague), the Netherlands. 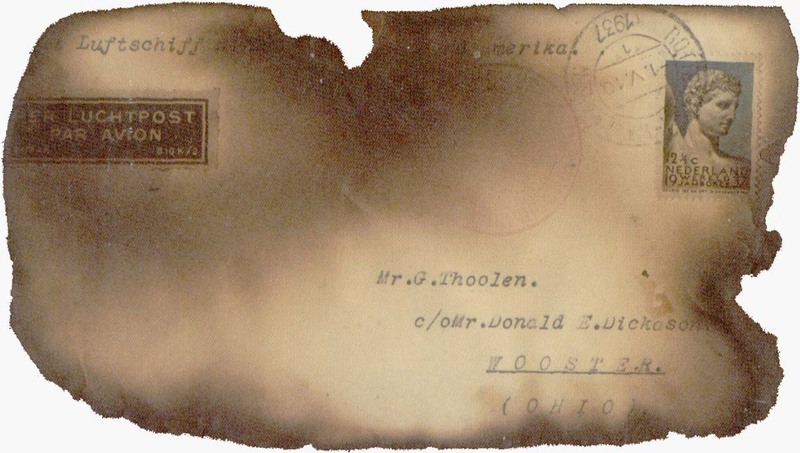 It is known that Mr. Thoolen also sent several covers by the airship Hindenburg to his stamp dealer colleague Donald E. Dickason in Wooster, Ohio, in 1936, and Mr. Dickason returned these to Mr. Thoolen upon receipt. Mr. Dickason was then past president of the American Air Mail Society. Mr. Thoolen's Hindenburg crash covers were purchased by Mr. Dickason in 1937. 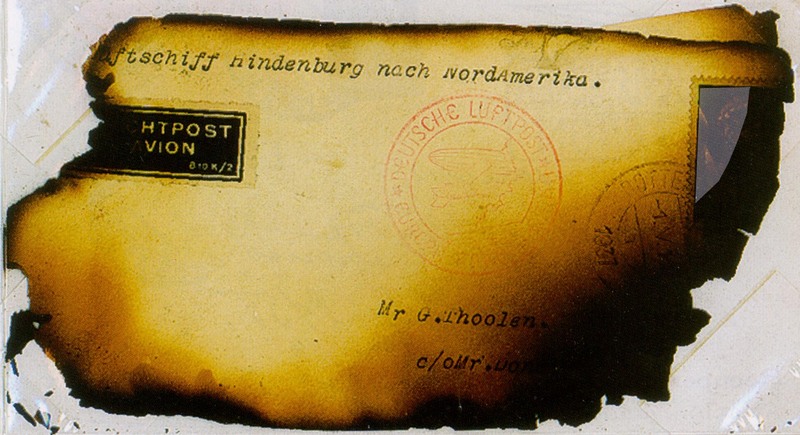 Falk's Hindenburg Crash Mail - The search Goes on, 1976  lists 17 items mailed from the Netherlands. These are the 'Thoolen' covers mentioned above. Further research by Ganz in Netherlands Hindenburg Crash Mail, 1985-86  and How Many of the Dutch Dispatches Survived?, 1987  increased the number to 26, that is nine covers in addition to the 17 'Thoolen' covers. Seven of these additional nine covers are franked with Jamboree stamps. The Dutch airmail catalogue Luchtpostcatalogus van Nederland en Overzeese Rijksdelen, 1998  and the two leading zeppelin mail catalogues, Sieger  and Michel , all state only 23 salvaged covers with Dutch franking. Michel  mentions specifically that 18 covers to Thoolen at Wooster, OH are recorded (i.e. one cover more than the other sources), and five covers to other addressees. The transmittal letter from Albert Goldman, Postmaster in New York, to the Postmaster in Wooster, Ohio, dated May 19, 1937 states: Enclosure addressed to: (2 packages) 17 letters Mr. G. Thoolen, Care Mr. Donald E. Dickason, Wooster, Ohio. A letter from the First Assistant Postmaster General Office in Washington DC dated August 13, 1938 to Charles W. Mihle says: the records of this Department indicate that . . . 17 for Mr. Thoolen. It was therefore believed that the number of 'Thoolen' covers presented in the Michel catalogue is incorrect, and for a long time 17 'Thoolen' covers were recorded. However, additional covers have been reported, thus increasing the known number of 'Thoolen' covers to 19. In this writer's opinion, cover #10 listed below is questionable since no postmark is readable. It may be a genuine 1937 cover, or a 1936 cover which has been treated or forged to look like a 1937 cover. Thoolen himself says only 13 covers! To further complicate the question about how many 'Thoolen' covers there were, the illustration above shows that stamp dealer Thoolen himself in a 1939 letter operated with a lower number of covers, only 13! The Dutch letter translates to Dear Mr. Buisman, Thank you for your letter. 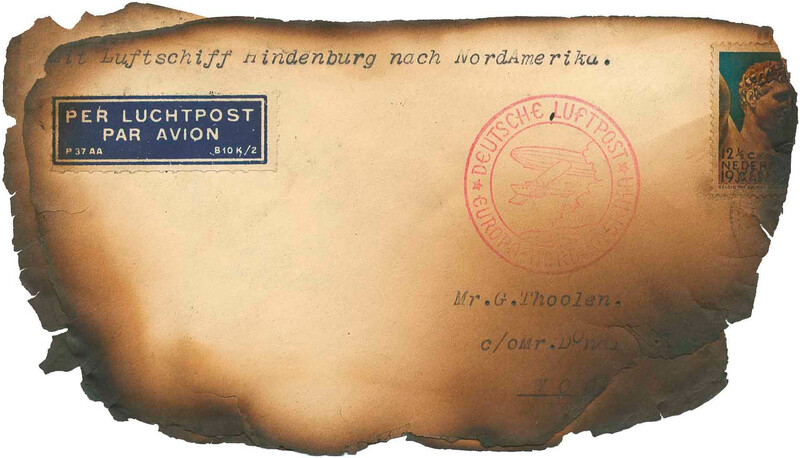 Herewith you receive two remainings of two covers, sent by the Hindenburg which burned. From my mailings, luckily 13 pieces were salvaged. 11 of them are for sale in the USA and the two less nicer ones went back to Holland. They are absolutely genuine and went by the Hindenburg. My price for both interesting pieces (segment cut out). I give lifelong guarantee. Perhaps Mr. Thoolen gave a lower number in an attempt to increase the price? Clearly, further research is required regarding the number of 'Thoolen' covers. In addition to the 'Thoolen' covers, there are nine more covers recorded with Dutch franking which are sent to other addressees. 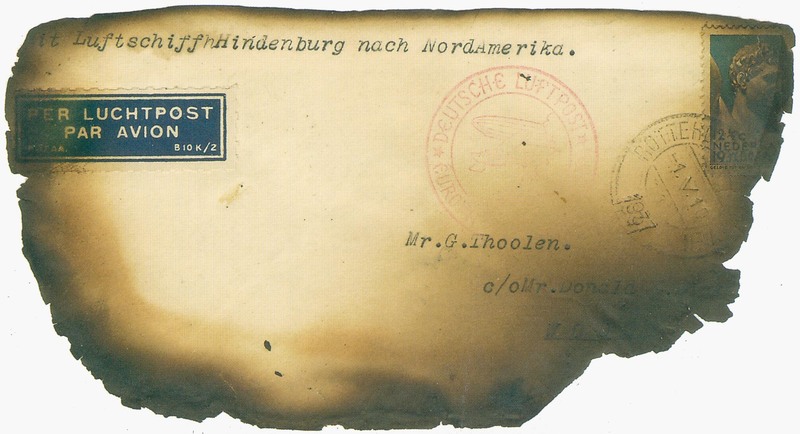 To summarize, a total of 28 examples of Hindenburg crash mail from the Netherlands are recorded, of which 25 or 26 were Scout franked. 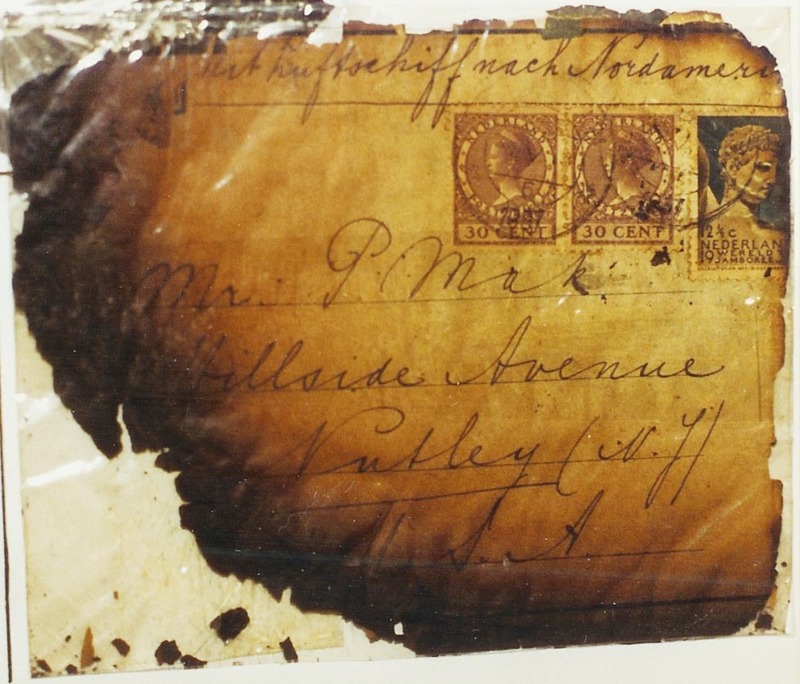 "The American postmaster hands a burnt cover from the perished Zeppelin to the addressee." This is one of the covers #18-20 below (courtesy Karl Pfankuch & co). 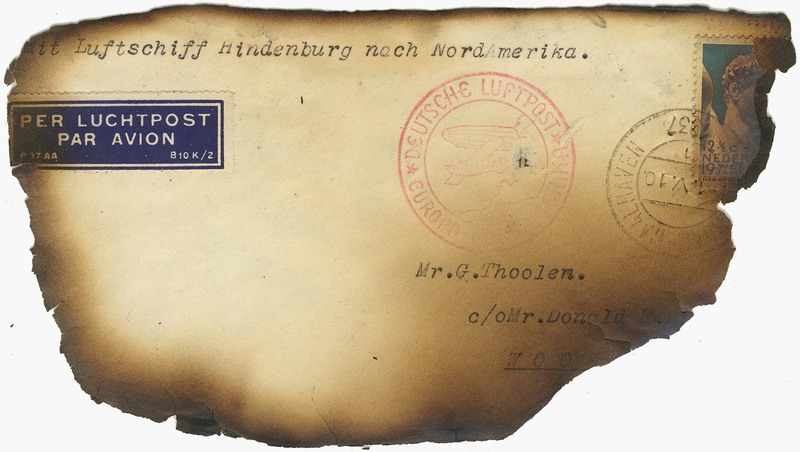 Sieger , Michel  and Leder  warn about forged Hindenburg crash mail items. 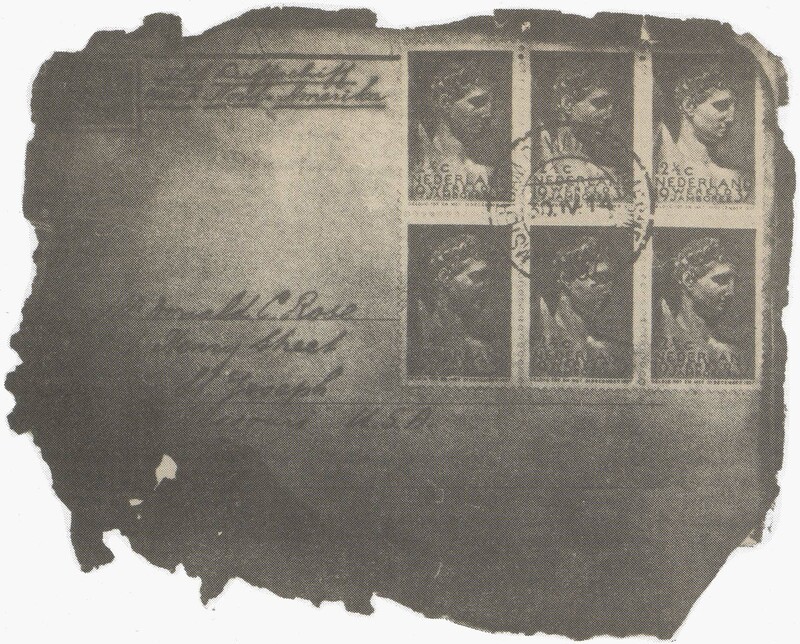 The recorded forgeries are covers with genuine German postage stamps and forged or altered postmarks. Mr. Leder informs this writer that to date no forgeries have been detected of the Dutch crash covers. 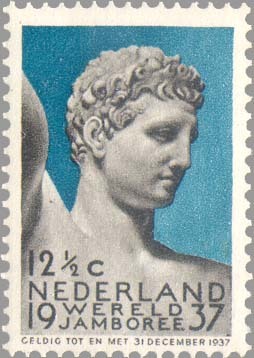 The postage rate for regular surface mail from the Netherlands to North America in May, 1937 was 12½c for letters up to 20 grammes, 2½c for printed matter up to 50 gr and 7½c for postcards. Additional fee for transport by zeppelin was 60 c for letters per 5 gr and for postcards, and 10 c per 5 gr for printed matter . 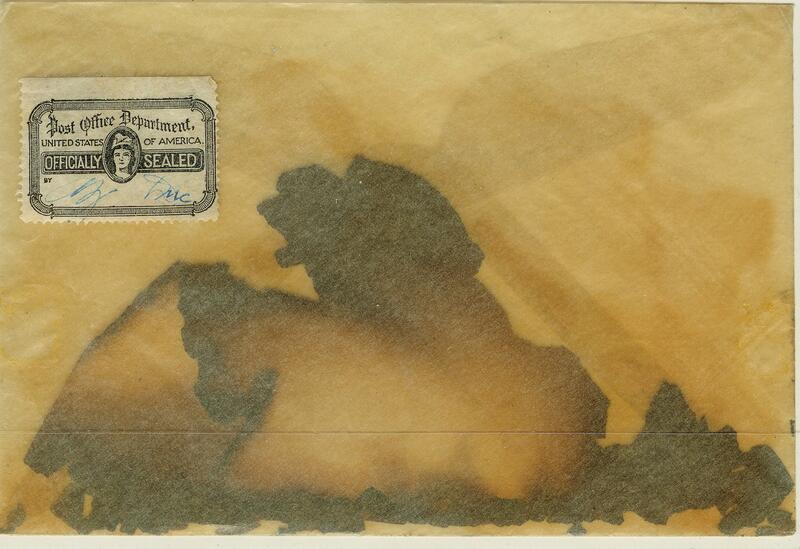 The complete zeppelin mail rate up to 5 gr was thus 12½c plus 60 c, total 72½c for letters. Similarly 2½c plus 10 c, total 12½c for printed matter up to 5 gr. The 'Thoolen' covers were each franked with one 12½c stamp, and are thereby correctly franked for printed matter. 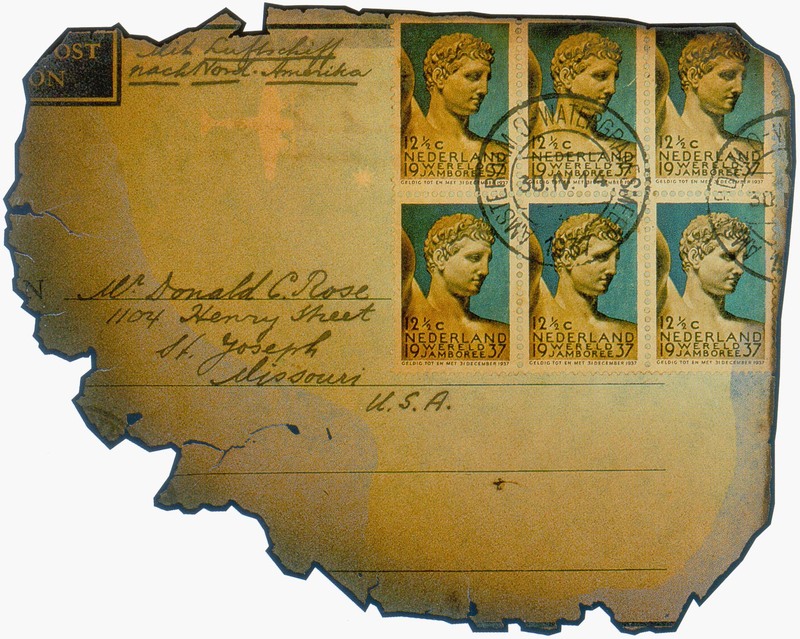 The covers with six 12½c stamps are overfranked by 2½c. 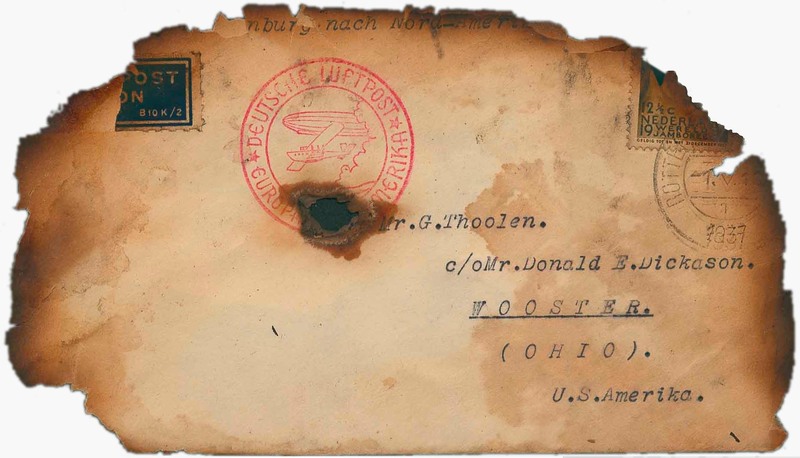 1-17, 27-28 Mr. G. Thoolen, c/o Mr. Donald E. Dickason, Wooster, Ohio Rotterdam-Waalhaven, May 1. 18-20 Donald C. Rose, 1104 Henry Street, St. Joseph, Missouri Amsterdam Watergraafsmeer, April 30. 21-22 R.F. Lutz, Philadelphia, Pa. 's Hertogenbosch, May 1. 23 Mrs. Benn Lewis, Ocean Ave., Brooklyn, NY Amsterdam Centraal Station, May 1. 24 Eva List, 1143 Forest Avenue, Ann Arbor, Mich. Amsterdam Centraal Station, May 2. 25 Mr. P. Mak, Hillside Avenue, Nutley, NJ Schiedam, May 1. 26 Mrs. E. Le Mee, 6802 Ridge Blvd, Brooklyn, NY Haarlem, May 1 or 2. 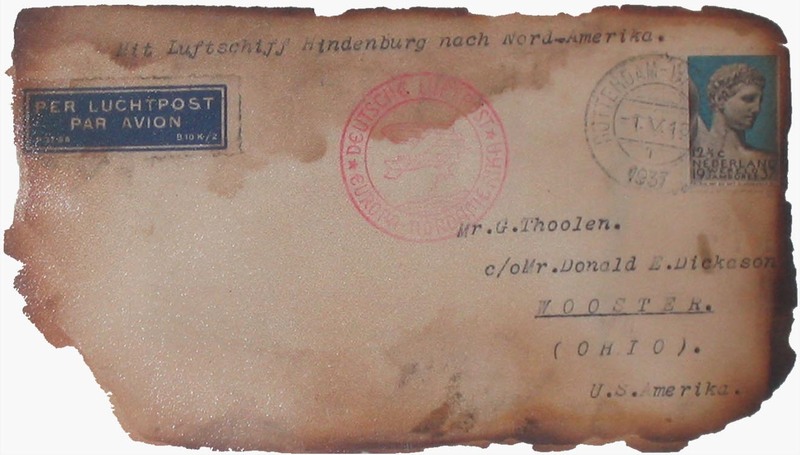 Below are shown illustrations of all the the recorded Hindenburg Crash Mail items from the Netherlands. This is the first time ever that these illustrations are shown together. No. 1. 'Thoolen' cover, franked with one 12½ cents Jamboree stamp (courtesy the owner). No. 2. 'Thoolen' cover, franked with one 12½ cents Jamboree stamp (courtesy the owner). No. 3. 'Thoolen' cover, franked with one 12½ cents Jamboree stamp (courtesy the owner). No. 4. 'Thoolen' cover, franked with one 12½ cents Jamboree stamp, and U.S.P.O.D. sealed wrapper (courtesy Panayotis D. Cangelaris). No. 5. 'Thoolen' cover, franked with one 12½ cents Jamboree stamp (courtesy Chiani-Auktion, Switzerland). No. 6. 'Thoolen' cover, franked with one 12½ cents Jamboree stamp (courtesy Ulrich Felzmann Briefmarken- und Münz-Auktionen, Germany). No. 7. 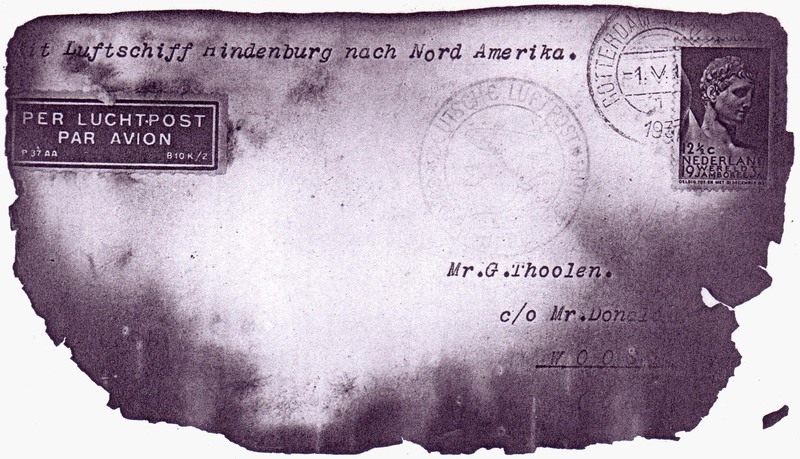 'Thoolen' cover, franked with one 12½ cents Jamboree stamp (courtesy Ulrich Felzmann Briefmarken-Auktionen, Germany). No. 8a. 'Thoolen' cover, franked with one 12½ cents Jamboree stamp (courtesy The Zeppelin Collector). No. 8b (previously No. 29 which was identified by Dieter Leder to be the same as No. 8). 'Thoolen' cover, franked with one 12½ cents Jamboree stamp (courtesy Zvi Aloni). No. 9. 'Thoolen' cover, franked with one 12½ cents Jamboree stamp (courtesy the owner). No. 10. 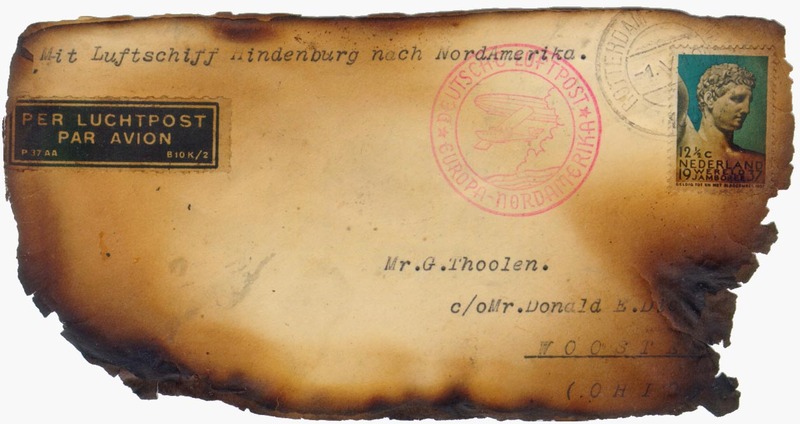 'Thoolen' cover, was possibly franked with one 12½ cents Jamboree stamp (courtesy Bjørn Schøyen). No. 11. 'Thoolen' cover, franked with one 12½ cents Jamboree stamp (courtesy Nutmeg Stamp Sales Inc., USA). No. 12. 'Thoolen' cover, franked with one 12½ cents Jamboree stamp (courtesy Christ-Stamps). No. 13. 'Thoolen' cover, franked with one 12½ cents Jamboree stamp (courtesy Sotheby's). No. 14. 'Thoolen' cover, franked with one 12½ cents Jamboree stamp (courtesy The Zeppelin Collector). No. 15. 'Thoolen' cover, franked with one 12½ cents Jamboree stamp (courtesy Aerophilatelie Palmer). No. 16. 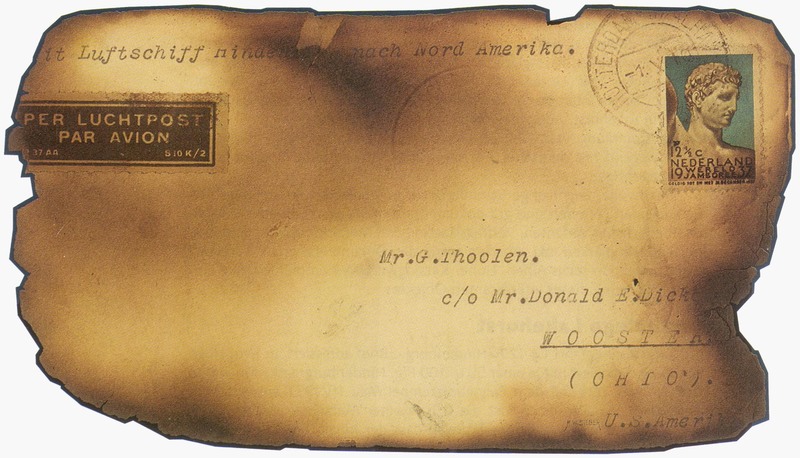 'Thoolen' cover, franked with one 12½ cents Jamboree stamp (courtesy Van Dieten Postzegelveilingen BV). No. 17. 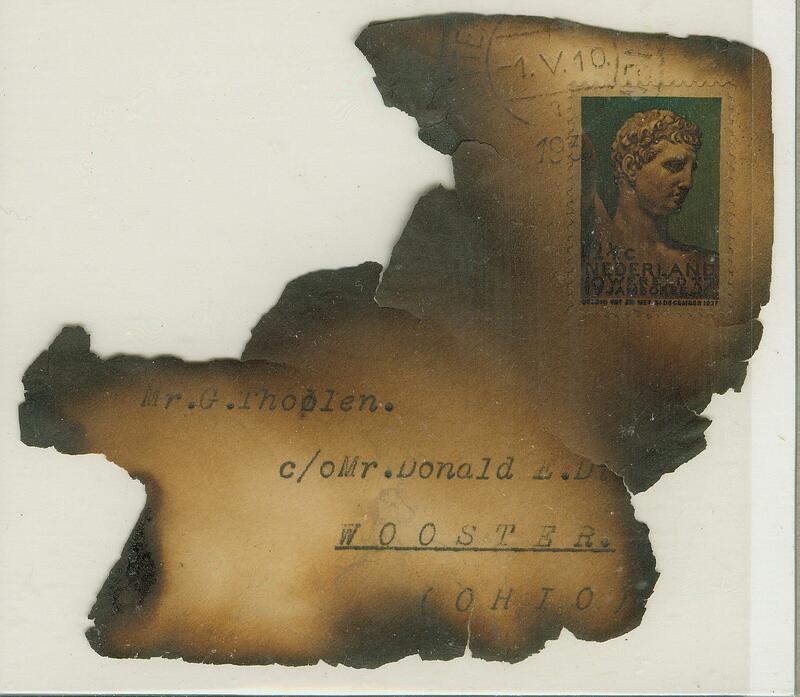 'Thoolen' cover, franked with one 12½ cents Jamboree stamp (courtesy Dieter Leder). No. 18. Cover to Mr. Donald C. Rose, St. Joseph, Missouri (courtesy Heinrich Köhler, Germany, Chiani-Auktion, Switzerland and Christ-Stamps, Germany). 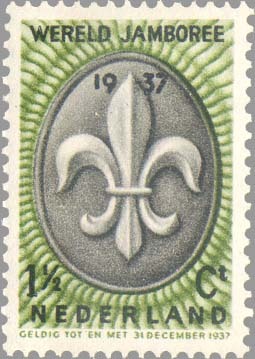 Franked with block of six 12½ cents Jamboree stamps. Comparing the illustrations, it could look like that the cover edges have been trimmed. The bottom image shows, however, the cover with contents which makes the cover looking larger. No. 19. Cover to Mr. Donald C. Rose, St. Joseph, Missouri (courtesy Superb Auctions, Torrance, CA and Köhler-Auktion, Germany). No. 20. Cover to Mr. Donald C. Rose, St. Joseph, Missouri (courtesy Karl Pfankuch & Co). No. 21. Cover to R.F. Lutz, Philadelphia, Pa. (courtesy Julian van Beveren). Franked with one 2½ cents and one 70 cents non-Jamboree stamps. Below: 1982 letter from A. Falk to F.C. van Beveren explaining this cover (courtesy Julian van Beveren). No. 22. Cover to R.F. Lutz, Philadelphia, Pa. (courtesy Cheryl Ganz and Roger Koerber auction). No. 23. Cover to Mrs. Benn Lewis, Brooklyn, NY (courtesy Cheryl Ganz and Michael Rogers auction). Franked with six 12½ cents Jamboree stamps. This envelope is still contained within its original USPOD sealed wrapper. No. 24. Cover to Eva List, Ann Arbor, Mich. (courtesy Oded Eliashar). Franked with four 12½ cents Jamboree stamps. No. 25. Cover to Mr. P. Mak, Nutley, NJ (courtesy Cheryl Ganz). Franked with one 12½ cents Jamboree stamp and two 30 cents non-Jamboree stamps. No. 26. Cover to Mrs E. Le Mee, Brooklyn, NY (courtesy Greg Manning Auctions, Inc., New York, NY). Franked with two 6 cents and five 12½ cents Jamboree stamps. No. 27. 'Thoolen' cover, franked with one 12½ cents Jamboree stamp. No. 28. 'Thoolen' cover, franked with one 12½ cents Jamboree stamp (left image courtesy Jacques C. Schiff, Jr. auction (2007), right image courtesy Matthew Bennett International (2012)). Possibly the left 2007 image is of cover front with cover reverse, and the right 2012 image is of cover front only. Or the cover has crumbled sice 2007. No. 29. 'Thoolen' cover, identified by Dieter Leder to be the same as cover No. 8, see above. Catalogue value according to Sieger  is EUR 17,500 (approx. 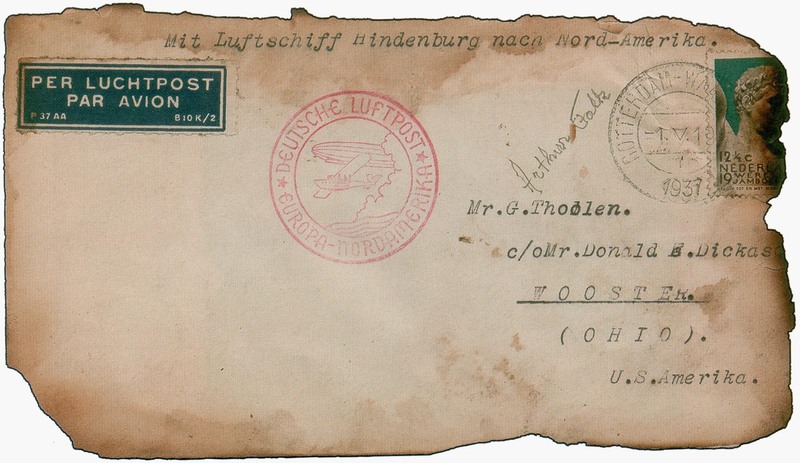 $22,900) for all Hindenburg crash mail items sent via Friedrichshafen. Michel  differentiates between the originating countries, and catalogue values are EUR 15,000 (approx. $19,600) for the 'Thoolen' covers and EUR 20,000 (approx. $26,200) for other Dutch covers. 1 Corinphila, Switzerland, auction sale May, 2001 (Ludwig Kofler collection). Sold for approx. $14,000 incl. premium. 2 Philatelic Pathfinders, Jericho, NY, USA, private sale, 1994. Weiss Philatelics, Bethlehem, PA, USA, auction sale No. 121, April 16, 1994. Opening bid $7,000, sold for $10,450 incl. 10% premium. 3 William A. Fox Auctions, Inc., NJ, USA, auction sale July 25, 1991. Estimate $5,000-$7,500, sold for $6,600 incl. 10% premium. 4 Mercurphila, Frankfurt, Germany, auction sale No. 4, December 6, 1983. Sold for 8,400 DM. 5 Ulrich Felzmann Briefmarken-Auktionen, Germany, auction sale October 11-14, 2006. Sold for EUR 9,100 (approx $11,500) incl. 18% premium. Ulrich Felzmann Briefmarken-Auktionen, Germany, auction sale June 2-5, 2004. Sold for EUR 10,900 (approx. $12,900) incl.18% premium. Chiani-Auktion, Switzerland, auction sale May 12-16, 2003. Sold for CHF 10,800 (approx. $8,000) incl. premium. Haberer-Auktion, Germany, auction sale September 19, 1987. Starting price DEM 7,500 (approx. $4,100) plus premium. 6 Gert Müller GmbH & Co. KG, Germany, auction sale February 18, 2016. Estimate EUR 6,000, unsold. Ulrich Felzmann Briefmarken- und Münz-Auktionen, Germany, auction sale October 17-18, 2003. Sold for EUR 10,620 (approx. $13,500) incl. 18% premium. 7 Ulrich Felzmann Briefmarken-Auktionen, Germany, auction sale April 8, 2006. Sold for EUR 8,500 (approx. $10,500) incl. 18% premium. 8 Private sale (approx. 1995), $5,000. 10 Kjell Germeten A/S, Norway, auction sale 29 November, 2008. In lot including more than 50 Hindenburg items, sold for NOK 18,900 (approx. $2,700) incl. 18% premium. Hagedorn Auktion, Germany, auction sale June 29, 1992. Starting price DEM 1,750 (approx. $1,000). Hagedorn Auktion, Germany, auction sale January 10, 1992. Starting price DEM 1,600 (approx. $1,100). 11 Nutmeg Stamp Sales, U.S.A., auction sale November 22, 2005. Sold for $14,375 incl. 15% premium. Kover King, Inc., NY, auction sale May 12, 1987. Est. $4,500. 12 Christ-Stamps, Nuremberg, Germany, auction sale January 17-19, 2009. Starting price EUR 7,600 ($10,100) plus 17% premium, not sold. Matthew Bennett International, Baltimore, MD, USA, auction sale October 19-20, 2007. Estimate $12,000-15,000 plus premium, not sold. Aerophilatelie Johannes E. Palmer, Germany, auction sale Oct 16, 2004. Starting price EUR 9,000 (approx. $11,200) plus premium, not sold. J&K, Köln, Germany, auction sale April 3, 2004. Starting price EUR 10,000 (approx. $13,000) plus premium, not sold. 13 Sotheby's, U.K., auction sale February 1994. Daniel F. Kelleher Auctions, U.S.A., auction sale May 18-19, 2017. Estimate $8,000-$12,000 plus 20% premium, sold for $7,200. 14 Auktionshaus Christoph Gärtner, Germany, auction sale February 2017, starting price EUR 7,500 (approx. $8,000), not sold. Christ-Stamps, Nuremberg, Germany, fixed price offer, EUR 8,200 (approx. $9,700). Christ-Stamps, Nuremberg, Germany, auction sale June 7-9, 2013. Starting price EUR 8,200 (approx. $10,600) plus 18% premium. Ebay, September 2012 (Seller Christ-stamps). Starting price $11,960. Christ-Stamps, Nuremberg, Germany, auction sale February 25, 2012. Starting price EUR 7,000 (approx. $9,100) plus 18% premium, not sold. Ebay, April 2011. Starting price $12,000, auction ended early by seller. Ulrich Felzmann Briefmarken-Auktionen, Germany, auction sale February 6-9, 2008. Starting price EUR 6,000, sold for EUR 8,730 (approx. $12,700) incl. 18% premium. Ulrich Felzmann Briefmarken-Auktionen, Germany, auction sale January 24, 2007. Starting price EUR 7,000 (approx. $9,200) plus 18% premium, not sold. 15 Auktionshaus Christoph Gärtner, Germany, auction sale October 2017, starting price EUR 7,000 (approx. $8,300), not sold. Christ-Stamps, Nuremberg, Germany, auction sale December 11, 2010. Starting price EUR 8,500 ($11,900) plus 18% premium, not sold. Pumpenmeier Auktion, Germany, auction sale May 15, 2010. Starting price EUR 8,900 plus premium, not sold. Gert Müller, Karlsruher Briefmarkenauktionen, Germany, auction sale February 4-6, 2010. Starting price EUR 9,000 plus premium, not sold. Aerophilatelie Palmer, Germany, auction sale October 22, 2005. Starting price EUR 7,500 (approx $9,000), not sold. Steve Ivy Philatelic Auctions, Inc., NY, USA, auction sale November 21, 1989. Est. $4,000-5,000. 16 Auktionshaus Felzmann, Germany, auction sale October 21-23, 2010. Starting price EUR 7,000 plus premium, not sold in auction, but is reported to have been sold after auction. Van Dieten Postzegelveilingen BV, Netherlands, auction sale March 2009. Sold for EUR 9,900 (approx $12,400) incl. 20.5% premium. 18 Nordphila, Germany, auction sale September 2016, starting price EUR 7,200 (approx. $8,100). Auktionshaus Christoph Gärtner, Germany, auction sale June 2016, starting price EUR 7,500 (approx. $8,500), not sold. Auktionshaus Christoph Gärtner, Germany, auction sale February 10-14, 2014. Starting price EUR 8,800 ($12,100) plus 18% premium, not sold. Christ-Stamps, Nuremberg, Germany, auction sale December 11, 2010. Starting price EUR 9,800 ($13,700) plus 18% premium, not sold. Chiani-Auktion, Switzerland, auction sale May 12-16, 2003. Sold for CHF 14,400 (approx. $11,200) incl. premium. Heinrich Köhler, Germany, auction sale October 8-11, 1986. Sold for DEM 8,200 (approx. $4,100) plus premium. Unknown auction sale, Germany, 1983. Sold for DEM 8,300 (approx. $3,100) plus premium. 19 Superb Auctions, Torrance, CA, USA, auction sale September 22, 1989. The above 1989 auction catalogue mentions that this cover realized $500 when last sold in the 1940's. 20 Karl Pfankuch & Co, Germany, auction sale July 30, 2011. Sold for EUR 8,070 incl. 17% premium ($11,500). Heinrich Köhler, Germany, auction sale, 1990. Sold for DEM 13,500 (approx. $8,000) plus premium. 22 Roger Koerber, USA, auction sale. 23 Auktionshaus Christoph Gärtner, Germany, auction sale 2009. Sold for EUR 5,000 incl. 18% premium (approx. $7,000). Michael Rogers, FL, USA, auction sale September 22, 1991. 24 Cherrystone, New York, NY, USA, auction sale July 17-18, 2018. Estimate $10,000 plus premium, not sold. Updated! Nutmeg Stamp Sales, USA, auction sale April 3, 2007. Sold for $10,400 incl. 15% premium. Western Auction, Torrance, CA, USA, auction sale October 13, 1979. Sold for $7,700 incl. 10% premium. 25 Van Dieten Postzegelveilingen BV, the Netherlands, auction sale 12-14 September, 2005. Sold for EUR 7,500 incl. 20.5% premium (approx. $9,700). 26 Greg Manning Auctions, Inc., New York, NY, USA, auction sale January 27-28, 1983. 28 Matthew Bennett International, Baltimore, MD, USA, auction sale February 28-29, 2012. Sold for $6,038 incl. 15% premium. Jacques C. Schiff, Jr., Ridgefield Park, NJ, USA auction sale January 10-11, 2007. Sold for $8,400 incl. 10% premium. Thanks to John 'Ben' Adams, Zvi Aloni, Julian van Beveren, Koos Biesheuvel, Panayotis D. Cangelaris, Josef Doert, Oded Eliashar, Cheryl R. Ganz, Randall S. Frank, John Ineson FRPSL, Robert F. Kan, Dr. Frederick P. Lawrence FRPSL, Dieter Leder, Karl Pfankuch & Co. and Bjørn Schøyen for their valuable contributions to this article. Uzakewicz, Douglas, Lighter than Air, SOSSI Journal (Scouts On Stamps Society International), May/June 1995, pp7-16, with supplement in SOSSI Journal, May/June 1996, pp12-13. Van Treuren, Richard G., Odorless, Colorless, Blameless, Air & Space Smithsonian magazine, May 1997, pp14-16. Duggan, John, LZ 129 Hindenburg - The Complete Story, 2002. Falk, Arthur, Hindenburg Crash Mail - The search Goes on, 1976. Ganz, Cheryl, Netherlands Hindenburg Crash Mail, The Zeppelin Collector, published in The Jack Knight Air Log & AFA News, July-September 1985, pp30-33, with updates in January-March 1986 p51, July-September 1986 p47, October 1986 p40. Ganz, Cheryl, How Many of the Dutch Dispatches Survived?, The American Philatelist, May 1987, pp458-460. De Vliegende Hollander, Luchtpost-catalogus van Nederland en Overzeese Rijksdelen, 1998. Sieger, Zeppelinpost Spezial-katalog, 22nd edition, 2001. Michel, Zeppelin Specialized Catalogue, 2003. Verschuur, W.F., Zeppelin en Zeppelinpost, Jubileumtentoonstellingsgids Alphilia '96, 1996. Leder, Dieter, The Forgeries of the Lakehurst Mail, The Airpost Journal, June 1998, pp217-220. Please inform the author at hallvard@slettebo.no, should you have further information on Hindenburg crash covers with Dutch franking. In particular, new or improved illustrations of such covers are appreciated. Text and Web Layout - Copyright © 2004-2017 Hallvard Slettebø. Copyright status for audio, video and images of the disaster is uncertain. Audio, video, images and quotes not the author's remain in the copyright of the originator.